14-point, single ply, full tab folders with tab extension for easy VIN identification. Printed label placement lines for easy label application. 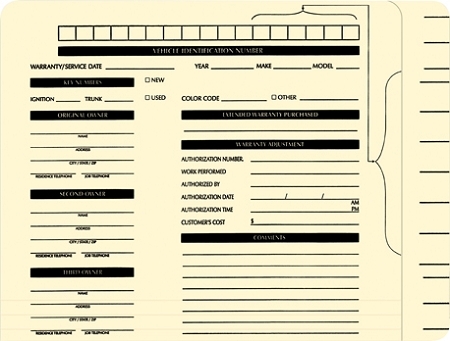 Printed with standard customer information section. Size is 12-5/8" x 9-1/2" overall with 11-1/4" x 9-1/2" flap. Packaged 100/pack or 500/case.